To-Fu 2, the sequel app to To-Fu: The Trials of Chi has been newly released to the App Store by HotGen Ltd. for iPad, iPhone, and iPod Touch. Players can once again join our stretchy protagonist in a quest to become a master of chi. The original To-Fu was released only a few months ago, so it’s not unreasonable to raise a skeptical eyebrow and wonder if a full sequel is being delivered. There is no need to worry however, as To-Fu 2 makes for a great follow-up to one of the hottest gaming apps of the year. Picking up where the last one left off the level designs continue to be innovative and engaging. Don’t be surprised to find yourself finishing levels with a smile on your face just for the sheer fact that it was so darn clever. The touch controls are smooth and the visuals are clean. Just like the original you blast yourself around the level, avoiding obstacles, hitting switches, going through portals and bouncing across walls all along the way. Timing, especially in the later levels, starts to be a major key to success, and things get especially tough when you lose the option of taking your time to aim the perfect shot. A new move in To-Fu 2 is the super ping maneuver, done by holding To-Fu in the aiming position for a few seconds to charge him up. The move is used to break through certain barriers, and more importantly gives off an unmistakably powerful blue aura. Also new to the game is a 45 degree ricochet panel which requires a demanding amount of precision, especially when confronted with a string of panels requiring a chain of ricochets from a single shot. In addition there are crumbling blocks that quickly disintegrate when you land on them, which call for a decent display of speed to manage. 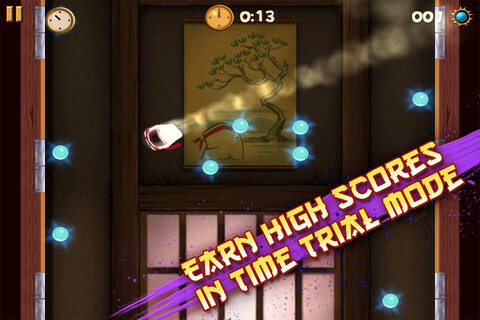 To-Fu 2 also features a new Time Trial mode which involves frantically collecting chi before time runs out. There is also a store which lets you buy new costumes and personalize your hero. 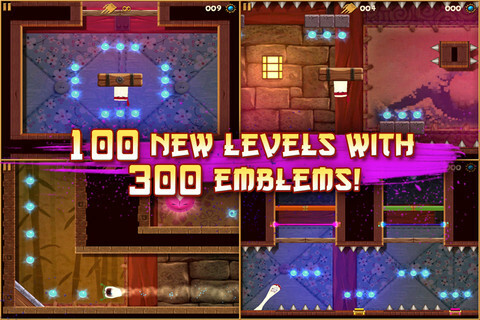 To-Fu 2 is a solid sequel to an amazing iOS game. It isn’t wildly different from its predecessor, but it definitely adds enough new features and improvements to warrant another round of fun. Users can test their chi in the app store for $0.99. AppSafari review of To-Fu 2 was written by Neema Akhtar on September 11th, 2011 and categorized under App Store, Games, Platformer, Puzzler. Page viewed 3672 times, 1 so far today. Need help on using these apps? Please read the Help Page.